Edward Van Halen earned his spot in the guitar tone hall of fame with the first note on his debut album in 1978. The guitar work on that album still boggles minds more than 25 years later. The tones that EVH got on that classic record are among the greatest ever, and a huge part of Eddie‘s guitar sound has always been the MXR Phase 90. The Phase 90 contributed to the unbelievable tones on "Eruption," "Ain't Talkin' 'Bout Love," "On Fire," and "Atomic Punk," plus many other timeless Van Halen tracks. 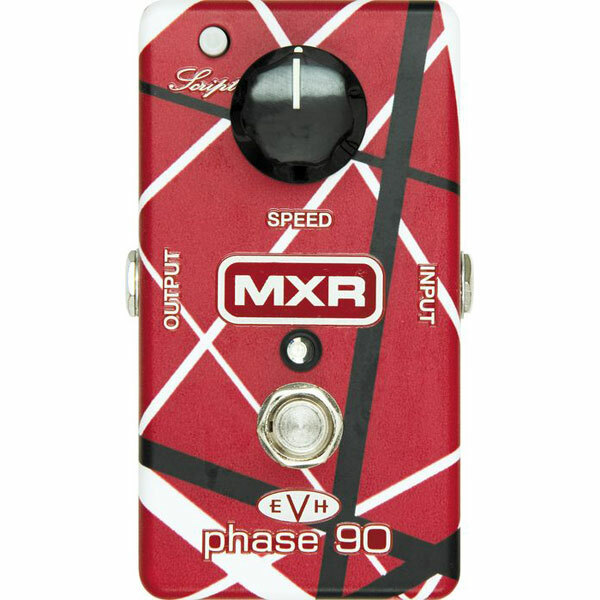 Now you can grab a piece of Eddie's magic with the new MXR EVH 90—a collaboration between Eddie Van Halen and Dunlop Manufacturing that represents a totally redesigned, updated version of the legendary Phase 90. The EVH 90 will give you the same great spacey swirls and hypnotic warbles that made the Phase 90 famous. But the EVH 90 also features the all-new Script switch that lets you instantly toggle between a vintage, "Script Logo" phase tone and a more modern, in-your-face "Block Logo" phaser. Plus, the EVH 90 sports the greatest graphics in the history of rock: the red, white, and black stripes from Eddie's legendary Frankenstein guitar. Oh yeah—it's also got a bitchin' new blue LED.